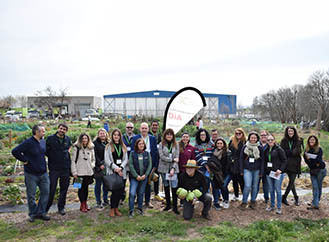 A team of 14 people from DIA, coming from its headquarters in Tarragona, yesterday visited our headquarters in l'Ametlla del Valles (Barcelona) to learn about the process of management of the used textile that we carry out. This activity is part of the visits to our preparation for reuse plants program. Humana and DIA collaborate since 2015 to promote the reuse of clothing and footwear, through a network of containers located in a selection of stores of the company, Catalonia, the Community of Madrid and Andalusia. Up to now, 504 tons of textile waste have been collected in them, which has made it possible to stop emitting 1.59 million kg of CO2. The DIA staff also had the opportunity to know the 3C of Palau-solità i Plegamans (Barcelona). The resources generated with the management of the textile collected in the Humana containers in the DIA stores allow co-financing of the social and urban agriculture project Cultivating Climate and Community 3C.